Exciting things have been happening behind the scenes at LanguageWire for what feels like a lifetime now. And today is the day we can final share some cool new stuff with you! You’ll see we’ve made substantial changes the next time you sign in to LanguageWire, all of which were made to make your life easier as well as simplifying the content creation process. A great user experience is at the core of everything we do at LanguageWire. Our goal is to make it as easy as possible for you to work with language experts from all over the world. That’s we focus on taking complexity and making it simple. You’ll find it easy to navigate LanguageWire, view project statuses and KPIs, update your user profile, collaborate with language experts and colleagues as well as starting new projects. Order core services for all stages of the multilingual content creation process. LanguageWire’s Standard Workflows follow best practices and make use of a global network of language experts so you can reach your global audience. There’s a host of easy-to-order services available in LanguageWire. 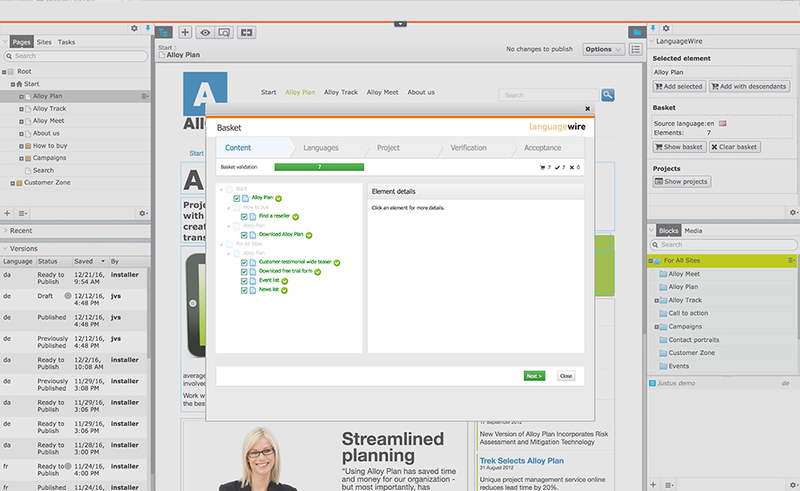 However, if these don’t match your needs, you can also create Custom Workflows. We’re happy to help you find the perfect solution. Just get in touch with the LanguageWire team and get started today. The number of options available to create your multilingual content can be daunting – just take a look at the broad range of services available range of services via LanguageWire. Let the Project Guide take you through the process of building the best workflow for your needs. The easy-to-follow instructions help you bring together the perfect mix of language services. Setting up a new multilingual content project has never been so easy. Save recurring projects for later use. You’ll avoid the need to rewrite briefs, add reference material, enter target languages and define work areas every time you start a project. You can save and reuse any projects you create, saving you time and reducing the possibility of manual mistakes. 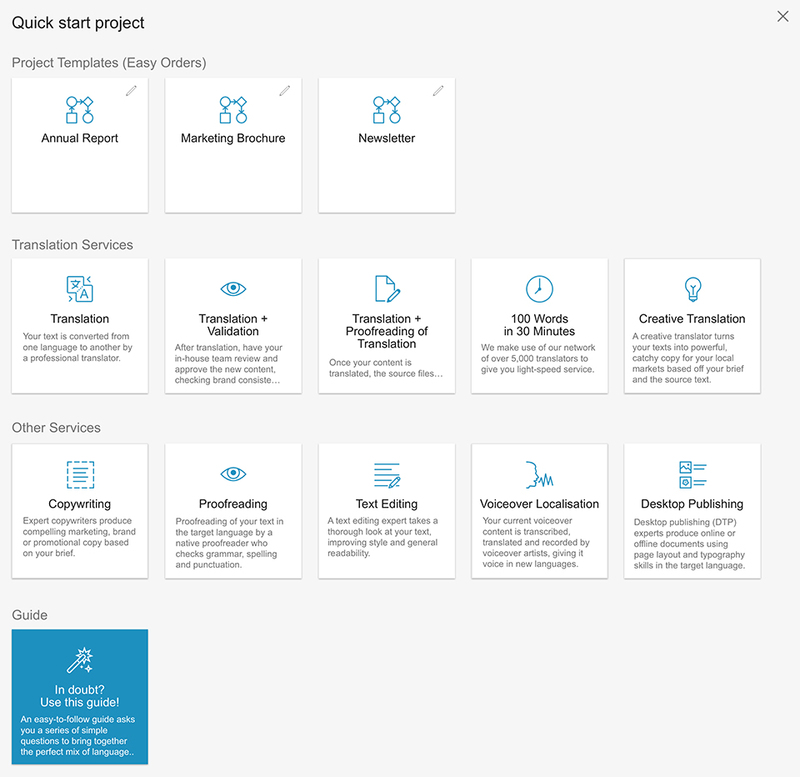 Whether you use a Standard Workflow, a Custom Workflow or create your project via the Project Guide; you’ll be given the opportunity to turn your project into a Project Template. Work with a handpicked team of language experts who understand your brand and deliver quality every time. We match you with a team of language experts who consistently work on your projects and become experts in your style of communication. With LanguageWire, you can choose from over 5,000 language experts who specialise in more than 175 languages. Integrate translation with your digital platform and benefit from a fully streamlined and native translation experience. Embedded in your own CMS or PIM environment, a LanguageWire Connector automates complex workflows, providing greater efficiency and reducing errors. And the best part? This is just the beginning! We’ll be rolling out new features over the coming months, all with the express purpose of helping you reach your global audience. To find out more about what LanguageWire has to offer, go to the plans page and explore the full feature list. Would you rather just talk to us about your needs? No problem, get in touch with us via the contact form below or give your local LanguageWire team a call.